Calum Bain set a personal best time in coming third in his 50m freestyle heat at the European Short Course Championship in Denmark on Friday. 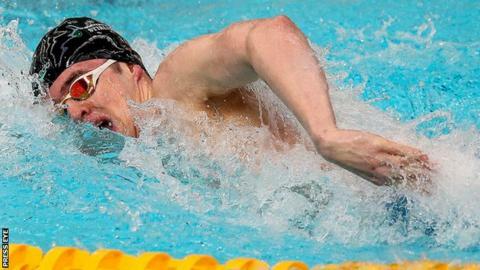 The Cookstown swimmer clocked 21.82 seconds but it was not enough to see him progress from the heats. Bain was just one-hundredth of a second behind Norway's Niksa Stojkovski while Krisztian Takacs won in 21.78. Bangor's Jordan Sloan produced a brave swim to finish sixth in the 200m freestyle final on Thursday. After setting a new Irish record in the heats to qualify third fastest, Sloan, 24, led early before dropping back. Sloan's time of one minute 44.12 seconds was .86 slower than his heat. Lithuania's Danas Rapsys took gold in 1:40.85 ahead of Russia's Aleksandr Krasnykh and Britain's Duncan Scott. Krasnykh clocked 1:42.22 with Scott finishing in 1:43.07 while Estonia's Kregor Zirk [1:43.84] and Dutchman Kyle Stolk [1:44.03] were also ahead of Sloan.